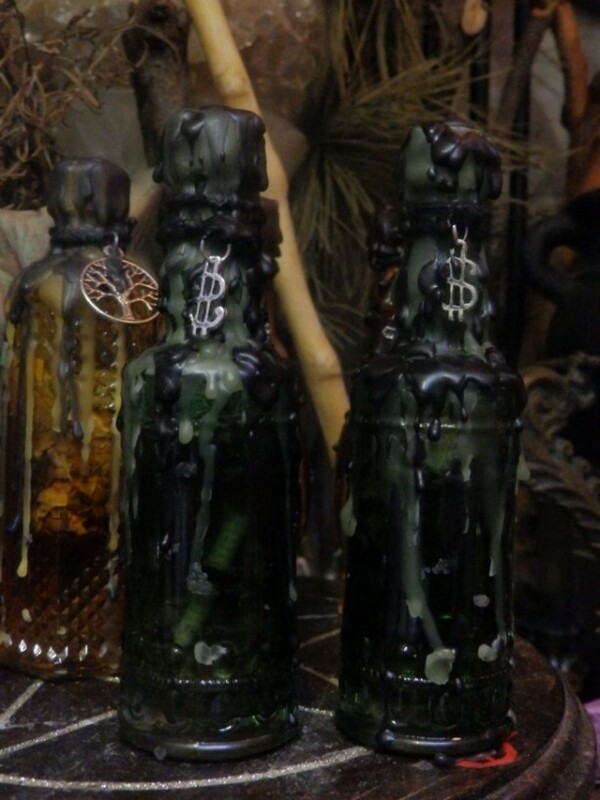 This listing is for a witches bottle filled with herbs, flowers, resins, spices and other materials correspondent to its intended purpose, then sealed with candle wax. It has been created to bring you earthly material abundance, wealth, prosperity and money, To bring you success at work and in business transactions and settlements. To draw stability and good luck into your home. Excellent to keep money flowing through steady work and to help keep your finances in order. This is also an excellent bottle to place in a business near the entrance to draw in customers with money to spend in your business or close to the cash register to draw in the money. If you have a home-based business then keep the bottle on your desk next to your computer or wherever you conduct business. 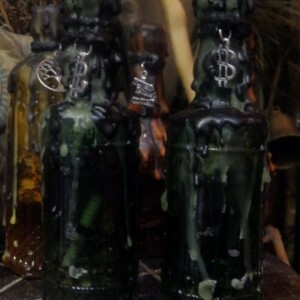 These witch bottles are already charged, blessed and ready to ship. This corked glass bottle is beautiful. Green tinted, and has a nice shape and pattern. Bottle measures approximately 5" tall with cork, excellent size to work with, hide and bury. 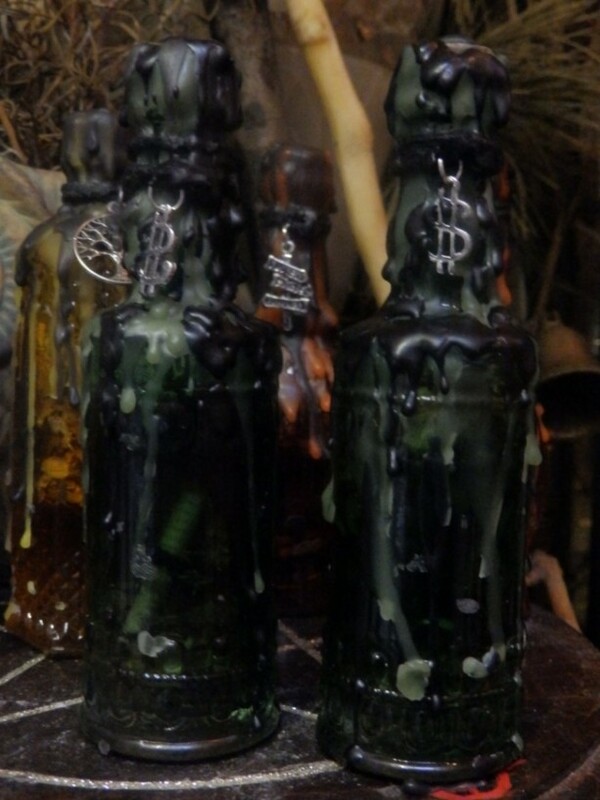 __________________________________ Witches bottles are created for a variety of reasons and concerns. They can be made for just about anything you want and/or need. They can be made to protect your property and family from all types of harmful intentions such as theft, intrusions, bad luck, hexes, curses, evil-eye, poverty, hunger, financial issues, negative energies. 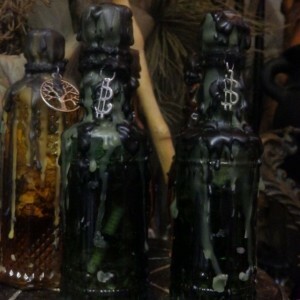 They can also be for cleansing, and to attract and draw love, money and stability. They are excellent tool for business success and to draw customers into your place of business, as well as to keep away unwanted people such as fake friends looking to destroy your life. They are to be buried in your property, inside your home/business in a large potted plant, or placed hidden at an undisclosed location. 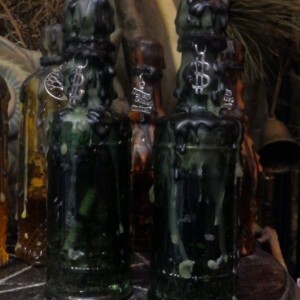 Witches' Bottles, also known as Spell bottles, are ancient protection spells of great power, that have been used in England and the United States since the 15th century. They were originally created to destroy the power of an evil magician or witch thought to have cast a spell against you and/or yours. They were often made of ceramic and stone vessels, filled with hair, nails, and urine. 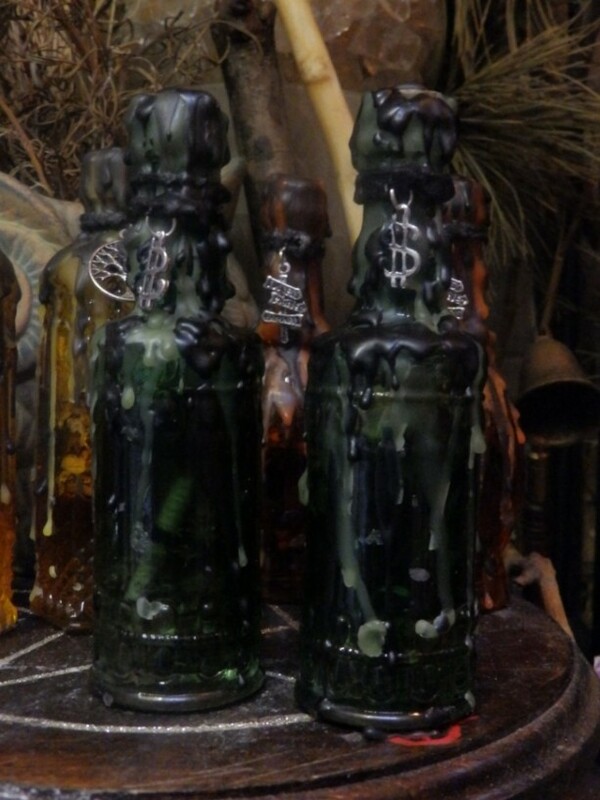 These witches' bottles are still being created for a variety of purposes and used in numerous ways, usually a glass jar/bottle filled with various objects of magical potency. They are then buried, hidden, placed on window sills or in other prominent spots. All are concentrations of energy, created and empowered for specific magical purposes. Ships via Priority Mail, insured.